When bringing home a cat or kitten, it’s important to teach the kids how to approach and interact with their new pet. Otherwise, there’s a risk that the cat will develop a phobia of children. Surprising children with a cat is not a good idea. Instead, families should discuss adoption beforehand, ensure that everyone is committed to taking care of the new pet, and choose a cat together. Having kids spend time with prospective adoptees beforehand is a recommended, as it will enable the family to determine whether or not a cat is comfortable with children. Families with children 6 years of age or younger shouldn’t adopt kittens under 4 months of age, as they can be injured or even killed by clumsy handling. Adult shelter cats that have lived happily with kids in the past are good prospects for households with young children. There are many cats that get along well with the children in their homes but are surrendered to shelters because their owners move or suffer financial or personal hardship. Such cats tend to be calm and patient and are unlikely to be anxious or aggressive with kids. Give the cat time to settle into her new home and get used to the various odours and sounds before introducing her to additional people. Instruct children to approach slowly, speak softly, bend or sit down on the ground, and slowly extend a hand to let the cat sniff before attempting to touch the cat. Have children offer the cat a few tasty treats either on the floor in front of them or in the palms of their open hands if the cat seems calm and interested. This will help the cat develop a positive association with children. 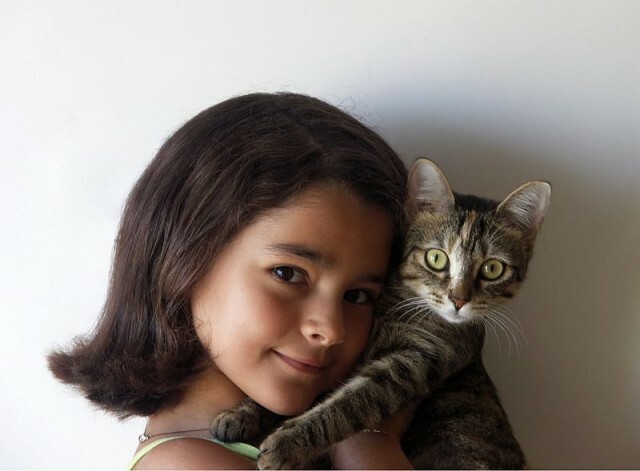 Supervise all initial interactions between young children and new pets until the kids prove that they can handle the cat gently and the cat shows no signs of aggression toward them. Teach children to recognize signs of feline aggression such as swishing tail, growling, flattened ears, dilated pupils, or the cat’s body suddenly becoming tense. Instruct them to leave the cat alone immediately if they see these signs. Let children know that if they surprise the cat, she may claw or bite, not because she is angry or hates them, but because she is frightened, so they should try not to scare her by sneaking up on her or grabbing her from behind. Provide the cat with a high perch (such as a cat tree) so that she can get away from the children when she needs some space. Move rapidly toward the cat. Make sudden, harsh noises that the cat might interpret as aggressive. Corner or trap the cat. Aggressively grab and restrain the cat. Pick the cat up by the scruff of her neck. Pull the cat’s tail or ears. Stroke the cat’s fur in the wrong direction. Play rough (kids may think it’s cute to have a kitten biting their hands, but kittens that are encouraged to do this will continue to bite and scratch as adults). Pick a cat up when she’s sleeping, eating, drinking, using the litter box, or grooming (except for medical or safety reasons). For those who are concerned about children being scratched, there is a product called Soft Paws, which comprises vinyl nail caps that fit over a cat’s claws to prevent scratches. The tips of a cat’s claws can also be trimmed, though the claws should never be removed entirely. Declawing is an extremely painful and traumatic operation that can lead to medical complications and lifelong behavioural problems such as litter box avoidance. To promote positive interactions between kids and cats, children should be taught how to play with cats and how to read feline body language. Positive interactions are particularly important for young kittens. Those who adopt kittens should be aware of the stages of development they go through, particularly the critical socialization period, which lasts up until about 14 weeks of age. During this period, kittens form lifelong impressions of different types of people, including children. The interactions a kitten has with children during this time will influence whether she grows up to be comfortable with youngsters or fearful of them. If adopting a cat for the kids, parents shouldn’t make the children solely responsible for her care. Cats often suffer when children forget to feed them or avoid changing their litter, and being scolded by parents over cat care issues may cause children to resent the cat and rob them of the opportunity to form a positive bond with their pet. Children should be taught how to care for pets and encouraged to help with pet care, but ultimately, it must be the responsibility of adults (or mature teens) in the household to ensure that pets receive sufficient food, water, exercise, and medical care. Cats International. (2007). “Kids and Cats.” CatsInternational.org.